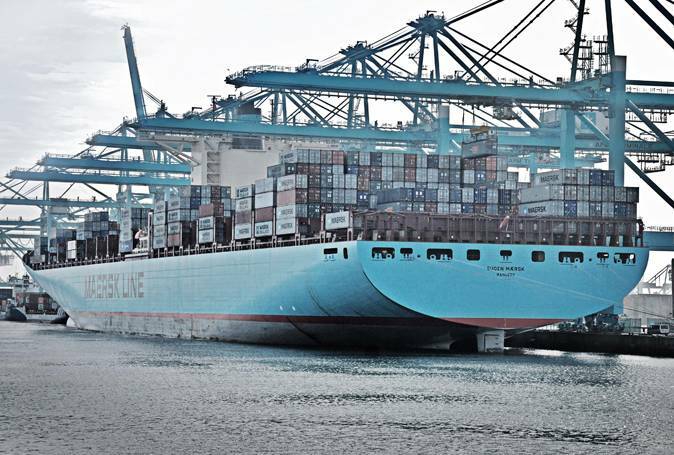 The new Triple-E class container ships are set to debut with Maersk livery. Maersk’s purpose in acquiring these behemoths is to take advantage of thier enormous capacity, which will enable Maersk to carry the greatest number of containers in the most energy efficient way, with the smallest CO2 footprint. Maersk thinks the time is ripe to order these new vessels as the annual market growth for Asia to Europe (westbound) trade is forecast to be in the 5-8% range during 2011-2015. 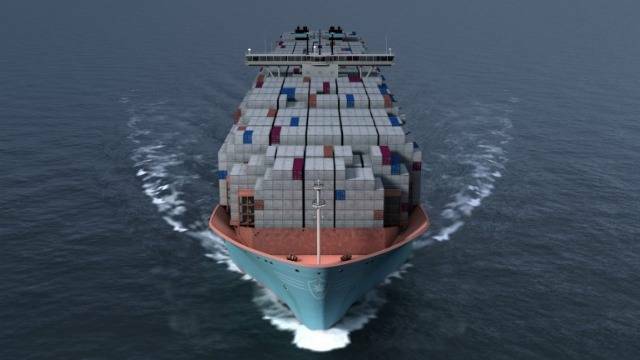 The Triple-E’s design expanded the ship’s inside cavity, attaining a 16% capacity increase in comparison to the Maersk Emma (equivalent to 2,500 containers), despite relatively little change in length and width. 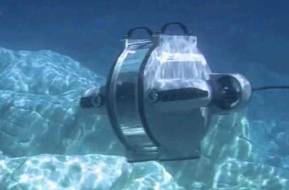 The Triple-E is designed to transport more cargo without adding engine power. Unlike Emma Mærsk’s more typical V-shaped hull, which limits container capacity towards the bottom of the ‘V’ in the cargo holds, the hull of the Triple-E is more like a U-shape. An additional row of containers was also added to the Triple-E, giving it 23 rows across its width compared to Emma’s 22. The more spacious hull and extra row provide an additional capacity for 1,500 containers. Additional container space has been created in the vessel by moving the navigation bridge and accommodation superstructure five bays forward, and the engine room and chimney six bays back in what is called a ‘two-island’ design. With the more forward navigation bridge, containers can be stacked higher in front of the bridge towards the bow (around 250 more containers) without losing visibility and approximately 750 more containers fill the space behind the bridge above deck and below deck using the space created by the engine room’s position further towards the stern of the vessel. The arrival of the Triple-E will trigger some changes in ports, possibly including dredging in some instances. While major port terminals have berths that can receive a 400-meter long vessel with a draft requirement of 16 meters, there is significant room for development in port infrastructure, such as crane size. The Triple-E class has already affected the container ship industry, with the scrapping of smaller vessel with high fuel consumption and also causing the cascading of larger ship towards trade routes normally served by smaller ships. Maersk’s competitors are also increasing the size of their ships on order, with at least 68 ships of 13,000 TEU or more on order.